There's been a lot of hype about John Williams' Stoner, first published in 1965 and recently reissued as a 'lost classic' - so much so that I still keep half-wondering if the whole thing is an elaborate hoax that will be revealed as a clever marketing campaign, and vaguely resisted reading the novel for some time. However, curiosity got the better of me and decided to give Stoner a try. I wasn't disappointed. 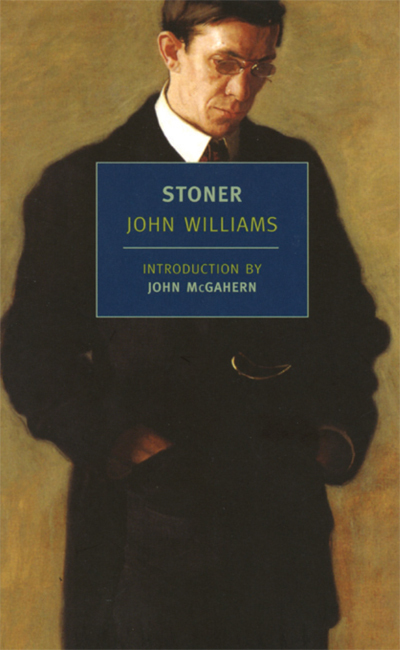 Stoner is a restrained, quiet novel about a restrained, quiet man - William Stoner, a farmer's son who attends university shortly before the First World War to study agriculture, switches to English literature and never leaves, remaining at his unremarkable college to continue an unremarkable career as a junior professor. Trapped in a marriage devoid of affection and distanced both physically and socially from his ageing, working class parents, Bill Stoner, an archetypal introvert, is stoical, unambitious and inconspicuous, almost painfully shy, 'held in no particular esteem' by and with few, if any, close friends. Marriage, a child, a short but deeply touching love affair and the publication of a minor work of literary criticism are the key events in Stoner's life, and there is little drama attached to any them; they pass, quietly, and for the most part, they fail one way or another. Stoner endures them all. His story is executed in such beautiful, gentle, precise yet understated prose that I found it profoundly moving and at times, almost unbearably sad. John Williams is a writer with the rare and enviable skill of being able to say so much in so few effortless, unostentatious words that the simplicity and subtle clarity of Stoner are almost (somewhat paradoxically) overwhelming. Plus, despite Stoner's insignificance, his lack of success, I didn't finish the novel feeling saddened. His is a man whose quiet dedication, his gentle satisfaction in his undistinguished work - his very lack of ambition - resonated with me in a way that made me feel there was, on some level, a sense in which he had triumphed. Within an hour of finishing Stoner I happened to see a comment on Twitter about it being a 'deeply misogynistic novel.' I'm baffled by this criticism. Stoner's marriage is, from the wedding day onwards, a miserable failure, and it can't be denied that his wife, Edith is portrayed as cold, brittle and unstable. However, it's also made abundantly clear that she is the product not just of her time and social class but also of a stifling upbringing that seems simultaneously over-protective and neglectful; moreover, her obvious mental health issues are untreated and dismissed (Stoner would rather bury his head in the sand than attempt to to discuss such a matter) and there are unresolved questions raised about her relationship with her father. William's and Edith's daughter Grace is by no means an unsympathetic character - troubled, yes, and psychologically damaged by her parents' wary, passive animosity, but ultimately someone we understand and for whom we feel sorry. Katherine, with whom Stoner has a short affair that glows from the shadows of the novel's pages like a firefly in the dusk, is bright, independent and decisive - and, moreover, Stoner's attraction to her is chiefly sparked not by her looks or youth, but by her academic brilliance. Stoner is one of those books that worked for me on such a private, personal scale that I can't really begin to explain adequately why I loved it. It would absolutely not be everyone's cup of tea, and there are times when the urge to take the characters to task, over poor decisions or their reluctance to communicate, and shake them by the shoulders until they see sense is strong. But this wistful, melancholy portrait of an unassuming life has a humane warmth that undercuts its sadness, and its own strange little way, feels oddly celebratory.